MUNICH - China on Saturday rejected German Chancellor Angela Merkel’s appeal to join a Cold War-era arms control treaty that the United States accuses Russia of breaching, saying it would place unfair limits on the Chinese military. “Disarmament is something that concerns us all, and we would of course be glad if such talks were held not just between the United States, Europe and Russia but also with China,” Merkel told the Munich Security Conference. Russia and the U.S. are the signatories to the 1987 INF treaty, which bans land-based missiles with a range between 500 and 5,500 kilometers (300 to 3,400 miles). U.S. President Donald Trump started the six-month withdrawal process this month. The United States and its NATO allies want Russia to destroy its 9M729 nuclear-capable cruise missile system, which Washington says could allow Russia to strike Europe with almost no warning. 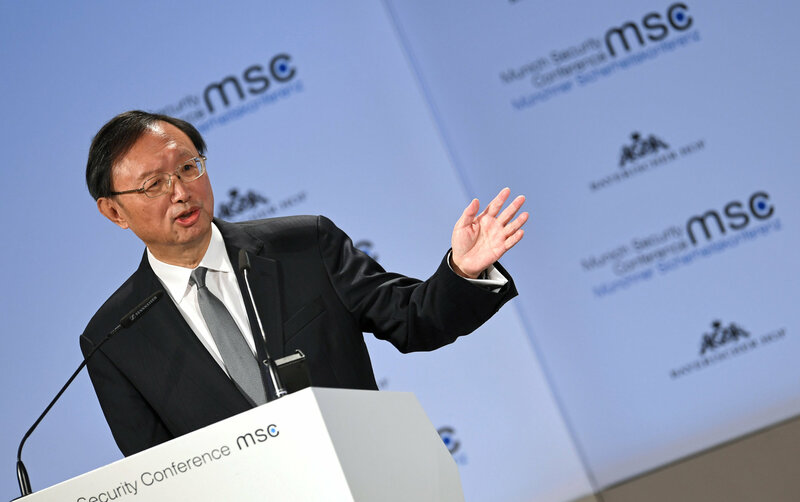 But China’s top diplomat, Yang Jiechi, who spoke on a panel in Munich, said that Chinese missiles are solely defensive. China’s missiles, which experts say pose a grave threat to U.S. military bases in Japan and elsewhere in the region, may also have played a large part in the decision to abrogate the INF treaty. The planned U.S. withdrawal from the treaty will make it easier for U.S. forces in the western Pacific to counter Chinese missile threats, Adm. Philip Davidson, head of the U.S. Indo-Pacific Command, told the Senate Armed Services Committee last week. “China, since they are not party to the INF treaty, has been investing in the kinds of weapons that create a serious challenge to us,” Davidson said. “Over 95 percent of their ballistic missiles would not be permitted under the INF.”The INF withdrawal would add better balance for U.S. forces, the admiral added. However, its unclear how and where U.S. missiles would be deployed — and if such a deployment would be politically viable, analysts say. China’s stated ambition is to modernize its People’s Liberation Army by 2035, improve its air force and push into new technologies including very high speed cruise missiles and artificial intelligence. Its defense budget grew nearly 6 percent between 2017 and 2018, according to the London-based International Institute for Security Studies. Retired Chinese Gen. Yao Yunzhu told delegates a new arms control agreement would only work if it included sea- and air-launched missiles, as well as land, because most of China’s military technology is ground-based and the country would not want to put itself at a disadvantage. Ground-based rocket launchers — cheaper to build, more mobile and easier to hide — are an attractive option to China as it develops its armed forces, experts say, whereas the United States operates more costly sea-based systems to comply with the INF. “China is traditionally a land power, and the Chinese military is a ground force,” Yao said. “If China is to enter into these kinds of negotiations, I think it ought to be more comprehensive to include not only land-based but also air and sea-based strike capabilities … and that would be hugely complicated,” she said. 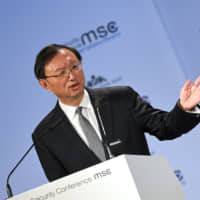 Top diplomat Yang, in his main address to the Munich Conference, singled out trans-Atlantic differences over multilateralism and technology investment, appearing to be trying to drive a wedge between the U.S. and its European Union allies. He spent much of his speech extolling the virtues of cooperation, international organizations and free trade — which are popular in Europe — and attacked the dangers of “protectionism” as well as “hegemony and power politics.” The U.S. wasn’t named, but the target was clear. Yang also disputed earlier warnings from U.S. Vice President Mike Pence that Chinese technology giant Huawei Technologies Co. would expose European 5G networks to the risk of espionage and suggested that Europeans deserve more respect from their traditional ally.